Your favourite upcoming games need your help – and there's only a few days left to vote for them at the world's biggest public-voted gaming awards, the Golden Joystick Awards 2016. Last year, millions of gamers voted for their favourite upcoming game, anointing Fallout 4 as the one to watch. There are 12 contenders for this year's coveted Most Wanted Game award, but only one can triumph supreme. How do I vote for the Most Wanted Game award? You can see the full shortlist for Most Wanted Game below, and cast your vote here at the Golden Joystick Awards 2016. Tune in on Friday, November 18, to find out who takes home the honors. Are you itching to return to space with Mass Effect: Andromeda? Or are you dying to experience the VR scares of Resident Evil 7? Perhaps you're loving Nintendo's new Switch console and The Legend of Zelda: Breath of the Wild? Or it could be that you are crowdfunding Star Citizen or Shenmue 3 and keen to give them that extra little bit of support. The world's biggest gamer-voted awards show is upon us, with the Golden Joystick Awards taking place on November 18th at the Indigo at The 02 in London. We're looking to crown the Most Wanted Game, and the power is in your hands to help choose which it will be. Hurry, though – since voting closes on October 31st, 2016. The emperor of all mankind sits inert on his golden throne, as he has for thousands of years. War wages throughout the galaxy, as alien and demonic forces oppose humanity’s spread across the cosmos. It’s a bloody future, and it sure sounds like fun. Relic Games returns to Warhammer 40K’s grim dark future for the first time since 2009. Blending the base-building of the original entry and the squad management of the sequel, Dawn of War 3 is already shaping up to be the power armor-clad RTS we’ve been waiting for. Click to vote for Warhammer 40,000: Dawn of War 3 at the Golden Joystick Awards 2016. When last we heard from Sony Bend, it was with one a pair of PlayStation Vita Uncharted games: Golden Abyss and Fight for Fortune. The studio has been moved over to the PS4 for its latest, a zombie action game that is more World War Z than The Walking Dead. As a former outlaw biker in the Pacific Northwest, you’ll be riding the dangerous highways as a bounty hunter. Or, if you aren’t careful, as food. Zombie food. Because they will eat you. NOMZ! Click to vote for Days Gone at the Golden Joystick Awards 2016. One of Sony’s biggest E3 2016 moments kicked off its press conference. Kratos is back, but he’s a long way from home. The extended demo was accompanied by a live orchestra conducted by composer Bear McCreary (Battlestar Galactica) and showed the gruff god-killer mentoring a young boy on a hunt. While we still know little, it seems God of War is going open-world and giving players more to do than dismember demons. This time there are frost giants to hack into ice cubes. Click to vote for God of War at the Golden Joystick Awards 2016. We love giant robots. We love dinosaurs. It’s no wonder we’re sold on Horizon Zero Dawn’s giant robot dinosaurs. Guerrilla Games is taking a break from having us shoot Killzone’s space Nazi-alike Helghast in urban environments. Horizon Zero Dawn marks a departure for the studio, with a lush world to explore and a mystery to unravel as humanity fights back against an onslaught of marauding machines. Click to vote for Horizon Zero Dawn at the Golden Joystick Awards 2016. Forgive the hackneyed joke, but we know that this one is top of many a Most Wanted Game on the Citadel list. With Commander Shepard’s mission over, it’s time to look beyond the Milky Way. The next chapter in BioWare’s Mass Effect series takes us to the eponymous Andromeda galaxy with a brother and sister duo leading the way. There are new aliens to meet, which means there are new aliens to shoot. As long as someone on our crew knows how to calibrate, we’ll be just fine. Click to vote for Mass Effect Andromeda at the Golden Joystick Awards 2016. Capcom is taking Resident Evil in a markedly different direction, ditching the tank controls for first person exploration. The upcoming seventh numbered entry drops us into a rural setting with a creepy family stalking our every move. The demo borrows heavily from games like Amnesia: The Dark Descent and Outlast, making us wonder how everything connects to Resident Evil’s storied past. Oh, and if you’re looking for a real scare, you’ll be able to play the entire game using PlayStation VR. Click to vote for Resident Evil 7 at the Golden Joystick Awards 2016. Platinum has its fingers in a number of pies these days, but we’re most excited for the one with dragons. No, we did not just confirm dragon pies. What we can confirm is that you have a friend that breathes fire, which is pretty darn sweet. Scalebound offers up four-person cooperative action, with each player controlling their own wyvern. The only question we have is how all of those huge lizards are going to fit on the screen at once. Click to vote for Scalebound at the Golden Joystick Awards 2016. We often glamorize the pirate lifestyle, but can we be honest for a second? Scurvy is gross. Swordfighting? Cannons? Hoisting masts and sails and stuff? That’s where the action is and what Rare's Sea of Thieves hopes to deliver. Of course, if you’re going to sail the seven seas, you’re going to want a crew. The AI isn’t going to cut it this time out. Assemble your friends, board your ship, and aim to misbehave. Click to vote for Sea of Thieves at the Golden Joystick Awards 2016. Sega’s cult hit forklift driving simulator is getting a third entry thanks to a successful crowdfunding campaign. Fans have been clamoring for a conclusion to Ryo Hazuki’s story. With Shenmue 3 finally in development, he might finally uncover the mystery of his mother’s murder. As for those of you who have no idea why Shenmue is so adored, it might be a good time to poke Sega for HD remasters. It’s either that or dig up a Dreamcast. Click to vote for Shenmue 3 at the Golden Joystick Awards 2016. He does whatever a spider can, but apparently, arachnids don’t play well on Xbox. Sony’s locked up the exclusive rights to an Insomniac-developed Spider-Man game with an entirely new story and flashy new suit. We only got our first glimpse of this at E3 2016, but we’re eager for more info to swing on in (hopefully soon). Click to vote for Spider-Man at the Golden Joystick Awards 2016. With $129 million raised from 1.56 million people, Cloud Imperium Games has a lot on the line. The ambitious Star Citizen has been the subject of numerous controversies. But if Chris Roberts can pull off his grand vision of a living universe filled with dog-fighting, huge space cruisers, and a star-studded single-player campaign, Star Citizen could change the way we look at gaming and crowdfunding. Click to vote for Star Citizen at the Golden Joystick Awards 2016. We’ve been feasting on HD remasters, spinoffs, and an excellent handheld entry for years, but The Legend of Zelda fans are thirsty for a new console entry. The last one was 2011’s Skyward Sword, but our long dry spell is set to end in 2017. Series director Eiji Aonuma has something big cooked up for Link’s return. Breath of the Wild looks to marry the vast open world of games like The Elder Scrolls V: Skyrim with the Tri-Force hunting magic we’ve been in love with since 1986. The big question mark about this one isn’t the game itself. But in addition to the Wii U, it’s also due out on the mysterious and unrevealed NX console which (as of now) is expected in March 2017. 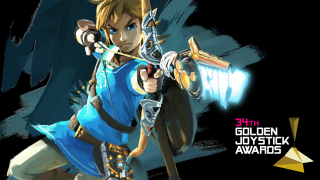 Click to vote for The Legend of Zelda: Breath of the Wild at the Golden Joystick Awards 2016. Be sure to vote in the Golden Joystick Awards 2016 by October 31. Find out which of these anticipated games comes away with the coveted award on Friday, November 18.